We’d love your help. Let us know what’s wrong with this preview of The Jane Austen Guide to Life by Lori Smith. The Jane Austen Guide to Life playfully and poignantly examines Austen's life and novels for the timeless advice that still applies for today's women. Austen may not understand texting or tweeting or platform heels, but as an astute student of human nature, she can surely teach us an awful lot about ourselves--and we might just be surprised by what she has to say. Published May 1st 2012 by skirt! To ask other readers questions about The Jane Austen Guide to Life, please sign up. Jane Austen's Guide to Life is a short collection of advise based on Jane Austen's books and personal letters. This was a light, easy read although it was not as good as I was hoping. It is the sort of thing I would have eaten up at age fifteen or sixteen, but now it felt somewhat feeble. The advise was good but generic. As an Austen fan myself, I understand how growing up on those books leads one to feel a degree of ownership over the characters and Austen herself. You feel like you know her and Jane Austen's Guide to Life is a short collection of advise based on Jane Austen's books and personal letters. This was a light, easy read although it was not as good as I was hoping. It is the sort of thing I would have eaten up at age fifteen or sixteen, but now it felt somewhat feeble. The advise was good but generic. As an Austen fan myself, I understand how growing up on those books leads one to feel a degree of ownership over the characters and Austen herself. You feel like you know her and by extension what she would think of certain things. The advise in this book was very much the author's interpretation of what Austen would tell us if she were alive. Some of the notions had much stronger arguments that others. But it comes down to Smith's theories of Austen's opinions since there is no way to verify it. While Smith clearly put in a lot of research, at times it felt more like she was discussing her BFF Jane than a supportable argument. For instance, the author's premise that because Austen loved studying people's follies that she would LOVE reality TV seemed very far fetched. There were also several places that were pure supposition. I don't think that talking about how her father PROBABLY gave Austen her writing desk or how her brothers PROBABLY let her have small roles in their plays added anything to the book. Overall, it was a nice collection of general coming of age advise for young women. I could criticize this author for ignoring half her potential audience with the subtitle and cover art, but I will leave those comments for a feminist to make. All her chapters addressed contemporary concerns of mine; even the exception--"Becoming a Woman of Substance"--was easily adaptable to my own situation. Further, the author made it clear that Austen's discovery and popularity were fueled by men as well as women: her six brothers, the Prince Regent, and even the Sir Walter Scott, the most I could criticize this author for ignoring half her potential audience with the subtitle and cover art, but I will leave those comments for a feminist to make. All her chapters addressed contemporary concerns of mine; even the exception--"Becoming a Woman of Substance"--was easily adaptable to my own situation. Further, the author made it clear that Austen's discovery and popularity were fueled by men as well as women: her six brothers, the Prince Regent, and even the Sir Walter Scott, the most popular novelist of the day. My chief gripe is that Smith refers repeatedly to characters and situations from four of Austen's novels, while virtually ignoring Mansfield Park and Northanger Abbey. The result is that the "thoughtful lessons" are repetitive, appearing in chapter after chapter. Part of my dissatisfaction with Smith is that I recently reviewed another book of "life lessons" from Austen's novels where the author--a male--made each of the six novels the basis of a chapter about his emerging maturity as a writer and scholar. In contrast, Smith's lessons reveal nothing of her personal engagement with problems faced by contemporary women. Her constant streams of advice and the piecemeal ways she presented them make her book seem like just another knock-off in the current craze for Austen. Since time-travel has yet to be invented, we can only surmise how Austen would have replied. Yet, for centuries she has been speaking to readers in an intimate way without many of us If you could be swept back in time two hundred years ago to have a cup of tea with Jane Austen, what would you ask her? Any question. No bars held. If I had the courage, I might ask her how did she become so wise in the ways of human nature and love? Or, did she intend to craft stories to entertain, or to enlighten? I thought I would really, really love this book, because I really, really love Jane Austen's books. But I think it's precisely that I am so familiar with her books that I didn't really, really love this book. I have read her books. Some multiple times. I have seen the plays made from the books. I have seen the movies made from the books (again, some multiple times). I'm familiar with her books, her style of writing, the plot points, etc. I thought that this book would hav I thought I would really, really love this book, because I really, really love Jane Austen's books. But I think it's precisely that I am so familiar with her books that I didn't really, really love this book. I have read her books. Some multiple times. I have seen the plays made from the books. I have seen the movies made from the books (again, some multiple times). I'm familiar with her books, her style of writing, the plot points, etc. I thought that this book would have more about Jane herself, from her correspondence and the like, than just rehashing plot points from her books. In that, I was disappointed. Probably 60 - 75% of the content in this book is re-hashing of plot points and characterizations from her books to make points on how the author must have felt about certain situations. As a writer myself, I have to say this is not necessarily an accurate representation of an author's thoughts, though in some cases it's pretty obviously true. Even though I've read The Jane Austen Guide to Happily Ever After (Elizabeth Kantor), The Jane Austen Handbook (Margaret C. Sullivan), and What Jane Austen Taught Me About Love and Romance (Debra White Smith), I can never get enough of Jane Austen's wise and valuable counsel! Laurel Ann Nattress of Austenprose and Vic Sanborn of Jane Austen's World both appear on the back cover giving this book their high praise and commendation. The Elegance: With fourteen charming illustrations and a simple, aesthetically pleasing hardcover, this novel has a very elegant presentation. In addition, I loved how the prose seamlessly flowed from biography to citations of Jane Austen's novels, from character analyses to modern applications. It was all very graceful! The Tone: Sometimes when authors are penning biography or scholarly studies their tone can become a little bit too didactic or formal. I am so pleased that I found Lori Smith's tone to be very approachable and relaxed. It felt like she was having a casual conversation, filled with thoughtful observations and clever connections. I quite liked it! I don't usually enjoy "self-help" books or books that try to give you advice on how to make your life better/easier/happier/more-Pinterest-worthy. But this book has no floofy advice about cleansing your inner cupboards or letting go of your fixations or whatever. This book, like Jane Austen herself, is very sensible, helpful, witty, and fun. The book is broken up into chapters that each deal with a subject, such as "living your dreams" and "finding a good man" and "saving and s I quite liked it! I don't usually enjoy "self-help" books or books that try to give you advice on how to make your life better/easier/happier/more-Pinterest-worthy. But this book has no floofy advice about cleansing your inner cupboards or letting go of your fixations or whatever. This book, like Jane Austen herself, is very sensible, helpful, witty, and fun. The book is broken up into chapters that each deal with a subject, such as "living your dreams" and "finding a good man" and "saving and spending." I really loved that this book delves into what Austen had to say (in fiction and letters) about every aspect of life, not just about love and marriage or becoming a nicer person. From "finding joy and laughter" to "enduring the hardest things," from "seeking fame and success" to "cherishing family and friends," it has something to apply to just about any life. And it does so from a gently Christian perspective, which I appreciated too. Though I am myself a huge Austen junkie, I personally didn't enjoy reading this. I found it rather dry and a chore to get through, while Austen's novels themselves take very little time to finish. Rather than mention specific examples, the writer seems to waste pages on rehashing Austen's works. I know what happens in her works; I've read them! Simple quotes and examples to connect to the lessons would have been sufficient. It was a struggle to get through, and I would avoid reading it again. This is definitely a book for Janeites! I *heart* the many lessons and morals presented in this book. Taking a theme approach, chapters make reference to not only her books but also her personal letters and draw thoughts on 'what would Jane do?' and I think the author did quite a good job. Testament to the enduring qualities of Austen's writing, this book has much to offer the reader of today. Loved it. A must-read for any Janeite! Lori Smith's writing is beautiful and the ideas, quotes, and lessons from Jane Austen lift off the page, linger in the reader's mind to ponder and to capture into the every day; a sweet look at bringing Jane Austen's life and books into the situations of the modern girl's world. A book to savor and re-read through the years. Easy, light non-fiction read. A bad tendency to be a bit repetitive though. A definite read for Austen fans. That's me! Although this book would probably appeal mostly to Jane Austen fans, it does deliver some good life lessons, taken from Austen's life and writings, with applications in today's world. Suffering from chronic lupus disease, the author may have had a special outlook on Austen's life. Thorough research (citations for letters as well as the novels) shows how deeply Lori Smith immersed herself in all things Austen. I really appreciated the good advice that came from Austen's life and her novels. I got to know and love her better, I got to know and love her books better, and the advice really made me think about how I live my life. I aspire one day to be like Jane. Not bad, A good visitation to the Austen books. But obviously, as it is situated after the "Lord of the Rings trilogy" In the scheme of my reading , it did suffer by comparison. Shining through most are the words by Austen, as of course they would. Even Tolkien admired them. Lots of lessons here, and information not only on the books Austen wrote but on her own life. At first I began to think this book was only about finding 'the right one'. Lessons like 'Finding the Right Man', 'Recovering from a Broken Heart', 'Marrying Well', 'Thinking About Love', etc., all took up the first half of the book (and being already married I was getting a bit weary of reading them!) However there were also worthwhile lessons like, "Cherishing Family and Friends," "Saving and Spending Lots of lessons here, and information not only on the books Austen wrote but on her own life. At first I began to think this book was only about finding 'the right one'. Lessons like 'Finding the Right Man', 'Recovering from a Broken Heart', 'Marrying Well', 'Thinking About Love', etc., all took up the first half of the book (and being already married I was getting a bit weary of reading them!) However there were also worthwhile lessons like, "Cherishing Family and Friends," "Saving and Spending", and "Finding Joy and Laughter", among others. "The Jane Austen Guide to Life" not only offers insights that Jane Austen may have been attempting to teach through her novel writing, but also facts about her life that I previously had not known. There are short synposes of her novels to illustrate the point, or 'lesson', that Lori Smith felt that Austen wants the reader to learn. "Perhaps Austen's best advice for us would be summed up in these two words: Know yourself. And by that, she wouldn't intend for us to delve into the deep emotional self-knowledge we cultivate today.... Instead, Austen would be referring to a moral self-awareness that for her was motivated in large part by her Christian faith. She was driven by an intense desire to understand her own failings and by God's grace to correct them." "I think Austen could give classes on loving life. She was engaged, even in small things. Daily concerns were not below her wit or interest. She could laugh about needing to repair her hat, 'on which You know my principal hopes of happiness depend,' she wrote - and tell Cassandra (her sister), "You know how interesting the purchase of a sponge-cake is to me." She had a talent for taking deep pleasure in common things." I was first introduced to Jane Austen when I was in college. I signed up for a semester class thinking that it would be something fun and would fulfill needed credits. I didn't know how very much I would fall in love with her writing, wit, and the time period in which she lived. Since then, I devour as many books as I can get my hands on that give insight into Jane's life, works, or the Regency period. I read Lori's book A Walk with Jane Austen several years ago. It was like being on a journey w I was first introduced to Jane Austen when I was in college. I signed up for a semester class thinking that it would be something fun and would fulfill needed credits. I didn't know how very much I would fall in love with her writing, wit, and the time period in which she lived. I read Lori's book A Walk with Jane Austen several years ago. It was like being on a journey with her as she traveled to all the places I've dreamed about seeing since I was a teen. Lori has a gift with words; reading them is like sitting down and having a conversation with your best friend. When I heard about her latest work, it piqued my curiosity. If Jane were here today, what would she think about our modern notions about love, life, womanhood, and pop culture? This book has many nuggets of wisdom with great examples from Jane's life and works that answers this question. Lori lays out each lesson with ease and ties it all together for you. It's almost as though she personally picked Jane's brain. My favorite word of advice: "Don't be afraid of a small life." Lori writes, "While we may look to fame for significance, Austen found meaning in the things that seem smaller to us--in her relationships with family and friends....The very quietness and smallness of that life might inspire fear in us--fear of not being significant or big enough--but for Austen, it was inspiration itself." This is a wonderful read that will make you fall in love with Jane's writing all over again. It inspired me to go back and re-read Austen's novels and see what other lessons Jane whispers from the pages. "In our era we are eminently comfortable with questioning, but we do so with an aim that is the opposite of Austen's. We tend to question standards with a view to relaxing them"
"If Austen equated goodness with happiness, we may be tempted to turn that equation on its head, to make happiness the supreme good and to justify anything in the name of getting there. For Austen, that would represent a great moral poverty." "[Austen] doesn't aim for her characters to set about changing the world or reforming the people around them ... [Austen's characters] are not on a mission, except as it pertains to themselves and their own lives. Thier Primary goal - which we may miss in our haste to get to the happy ending - is not to catch a husband, but to be virtuous, blameless. With Virtue, Austen knew they would have joy." I love how the author seems to get what Jane Austen is really about: virtue & and extremely high moral standards.. I did not enjoy reading a book in this in a VERY long time <3 the kind of joy that makes my heart & mind happy without one scolding the other! Besides my mother, Jane Austen played a major role in making me the woman I am today.. I am definitely going to read again for the author! Did you ever wish you could sit down with Jane Austen and share a cup of tea? I'm sure if you're like me, you'd have a million questions you'd want to ask her. Who was your inspiration for Mr. Darcy? Do you have any good love advice? What do you think of the modern-day internet dating phenomenon? Well, if you've ever wished to share your Lady Grey with lady Jane, this is your opportunity. Lori Smith's, "The Jane Austen Guide to Life," is everything Austen is: captivating, winsome, insightful, wi Did you ever wish you could sit down with Jane Austen and share a cup of tea? I'm sure if you're like me, you'd have a million questions you'd want to ask her. Who was your inspiration for Mr. Darcy? Do you have any good love advice? What do you think of the modern-day internet dating phenomenon? Well, if you've ever wished to share your Lady Grey with lady Jane, this is your opportunity. 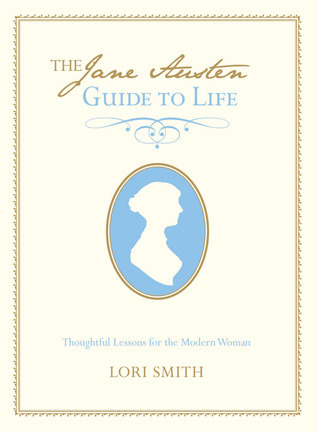 Lori Smith's, "The Jane Austen Guide to Life," is everything Austen is: captivating, winsome, insightful, witty, and fun. An enthusiastic, well-researched, and invested biography. The format of this book is very unique and really amazingly organized in way that you don't realize that you are essentially reading a biography. I thoroughly enjoyed the book in both its advice, filled with wisdom, and its excerpts from Jane Austen's amazing literary works. Jane Austen is the epitome of good habits, great wit, and the best values. As a Jane Austen fanatic, this novel is very enjoyable and was a much appreciated look into An enthusiastic, well-researched, and invested biography. The format of this book is very unique and really amazingly organized in way that you don't realize that you are essentially reading a biography. I thoroughly enjoyed the book in both its advice, filled with wisdom, and its excerpts from Jane Austen's amazing literary works. Jane Austen is the epitome of good habits, great wit, and the best values. As a Jane Austen fanatic, this novel is very enjoyable and was a much appreciated look into the person who was Jane Austen. It really illuminated the type of person she was and the type of life she led, which she lived with such grace and poise. If you love Jane Austen and her works , the book is a wonderful perspective of her through her writing. The advice that Lori Smith gives using the textual support of each of Austen's characters/works stuck with me personally. This book pushes you to endeavor to tap into your potential just as Jane did, as I now somehow feel close enough to her, to be on a first name basis. I have had one little problem with the book and it's kind of had me question some other information in the book. Lori Smith writes "Compared to Austen, we are a generation of hopeless romantics, just waiting to catch sight of the ri As with any interpretation of an author's work, Lori Smith uses what we know about Jane from her letters and those of her family to advise us on how Jane might advise us to live our lives. She uses examples from the books and it makes a nice little, light advice book. What a delightful read! If you are a Jane Austen fan, this is a must-read for your collection! The author explored not only Austen's works, but also her life, for this well-documented work. I was amazed at the author's complete knowledge of all things Jane Austen and how she formulated practical how-to's from her comprehensive writings and entire lifespan. Witty comments, thought-provoking lessons and morsels of truth are generously sprinkled throughout each chapter. Lori Smith takes Jane Austen's books and letters and finds patterns within them. Smith then devises the patterns into sections (chapters) and then subcategories. Smith does her research into Austen's work, but a lot of the book is based on assumption and personal opinion. I thought the book was laid out well and cleverly written. I would tend to agree with most of what Smith assumes Austen might have meant with her works and letters. This is a great book for any Jane Austen fan. While she didn't have the most perfect life, Jane always tried to see the good in every situation. She adored her family and close friends and would do anything for them. We could definitely learn a lot from her. I also think I was born 200 hundred years too late. Life just seems so much simpler then. I really don't like giving a bad review, I mean the author worked hard and all. But I skipped a lot of this book. The actual advice was just fine, but the way it was presented was tedious. It also seemed a bit sexist to me. The author basically took samples off of the novels written by Jane Austen to elaborate the life lessons and moral values she wanted to point out to readers. A simple and practical read for everyone who loves Jane Austen's works, what it teaches us and an insight into her life as well. The author doesn't pick up on any nuances or hidden lessons- she just rehashes the plot of the books, which I've already read. This seems to be written for someone unacquainted with Jane Austen's works, which is funny, because who other than an established Austenite read this book? Interesting enough. I got some good insights and realized even more, this day and age are messed up. Lori Smith is the author of The Jane Austen Guide to Life, A Walk with Jane Austen, and The Single Truth. She is an adorer of Jane Austen and a member of the Jane Austen Society of North America. She feels connections to Austen on many levels—as a writer, a single woman, an Anglican, and as someone struggling with a mysterious chronic illness. She spent a month in England tracing Austen’s life bef Lori Smith is the author of The Jane Austen Guide to Life, A Walk with Jane Austen, and The Single Truth. She is an adorer of Jane Austen and a member of the Jane Austen Society of North America. She feels connections to Austen on many levels—as a writer, a single woman, an Anglican, and as someone struggling with a mysterious chronic illness. She spent a month in England tracing Austen’s life before writing A Walk with Jane Austen, which received a starred review from Publishers Weekly and the Jane Austen Regency World Award for best nonfiction. Smith’s writing has also appeared in Washington Post Book World, Publishers Weekly, Beliefnet.com, Skirt! and Today’s Christian Woman. Lori lives in Northern Virginia with her sweet but stubborn English lab, Bess. Visit her online at www.writerlorismith.com or at the Jane Austen Quotes blog, www.austenquotes.com.